Solar thermal panels, at least of the size in a typical domestic installation, are capable of producing a good proportion of domestic hot water. Because of the large season variation at my latitude, 52 degrees north, this probably means all domestic hot water in summer, most of it in spring and autumn, and some of it in winter. That means you still need another way to heat your water - central heating boiler, immersion heater, etc. Also, bear in mind that you need somewhere to store the hot water before use - the sun can't produce your hot water 'on-demand'. So if you've got an 'instant' 'Combi' boiler, and no hot water tank, then it's not going to be so easy to incorporate solar - you'll need a tank installing somewhere. Although Combi boilers have become popular, I'm not certain that this is because they really have any advantages, other than easier plumbing, and no need for 'airing-cupboards'. 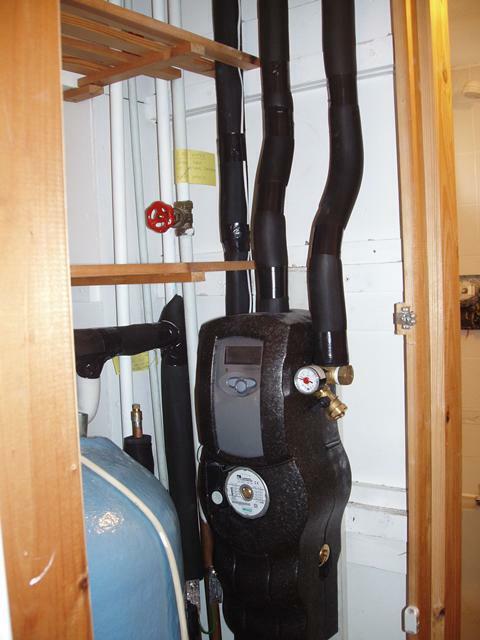 Some, but not all, Combi boilers can accept pre-heated water from a solar-heated storage tank. All in all, it's likely to be easiest to add a solar water heater if you've got a good old-fashioned non-pressurised hot water cylinder with a header tank in the loft. It's common to replace the hot water cylinder with a new one - perhaps larger, to store water through non-sunny days, and with two heat-exchanger coils, the lower one for solar, and the upper one for the boiler as before. There's perhaps more fuss made about this than it deserves. There are two basic kinds of panel. Evacuated tubes - the panels consists of a number of glass tubes, with a vacuum either inside, or between a double-glass skin (like a Thermos flask). The sunlight and heat can get in, but the heat inside can't easily get out. In some versions water circulates in the tubes, while in others the heat is collected by a metal heat-pipe, and is transferred to water in a manifold at one end. They still work will even when it's cold, because of the good insulation. Often said to be more expensive, but this isn't really the case. Flat plates - simplistically a glass box with water pipes inside. Modern ones are considerably more sophisticated. Difficult to make them work as well when it's cold, as the heat tends to be able to get out again. Can be made to blend in with a roof more than with evacuated tubes. The chances are that the proportion of your domestic energy bill spent on heating hot water isn't all that great. It tends to be small compared to the cost of heating the house. But still, the solar energy is free, and the a solar-thermal panel can provide a good proportion of yout hot water. I'd recommend that you take a look round Navitron's website to get an idea of the costs of materials for solar thermal panels. These people, based in Oakham, have largely pioneered the import of Chinese evacuated tube panels. A great many panels are made in China, where solar water heating has been popular for longer than here, even if the panels are sometimes badged by other manufacturers. There's also a 'forum' on the Navitron site where you can find out all manner of stuff, but you have to search rather hard these days, as it's been allowed to turn into a chat-room, and the relevant posts can be difficult to find. You can request installers to get in touch and quote, assuming any installers read it any more. You don't need a large area of roof for a solar-thermal panel, as they are quite efficient at catching whatever sun strikes them. It's best if the roof points somewhere between south-east and south-west, but not absolutely crucial. Some people have systems with two panels, one pointing east and the other west. Pointing north should really be avoided if possible. My installation has a single panel with 20 evacuated tubes, and covers an area of about 2 square meters. This is a fairly small installation - if you use lots of hot water, then more panels might be better, but as you might have seen from the Navitron site, you can buy a panel such as this for around £400 including VAT, so adding more shouldn't increase to cost too much, even after paying for installation. In this type of panel, the water (with antifreeze in my case) doesn't actually pass through the tubes - a heatpipe transfers the heat to water in the manifold at the top. So the tubes can be easily replaced (hopefully not needed), even with the system running. I have a 'spare' tube down on the ground, which is good for showing people how they work. Here is what I have in the airing cupboard. The pipes to and from the panel connect to a coil inside the hot water cylinder. There is a pump to circulate water, and a controller which only turns the pump on when the panel is hotter than the cylinder (by an amount you can set). Largely encased in polystyrene insulation, you can see the Resol FlowCon A pumpstation which incorporates the pump, controller, flowmeter, pressure gauge, and some other components. Of the three pipes heading off the top: left is 'flow' from the panel, middle is 'return' (passing though pumpstation), and right goes off to an expansion vessel in the loft.